Home › TrustLogo › What Trust Logos are credible for users? What Trust Logos are credible for users? Third-party trust marks are used on most commercial sites, to convince customers that they can carry out purchases in safe mode. There are many variations of trust logos, and recently was conducted a study on which logos are most trusted by American buyers. In this article, we look at the test and its results, as well as think about the fact, whether the logos are always needed. The test demonstrated the following logos to users, and also asked what logos cause maximum trust while shopping online. The results were as follows. Among the 2500 respondents about 1200 responded that they do not care or had no preference. What’s interesting – the actual security provided by seals did not affect the results. 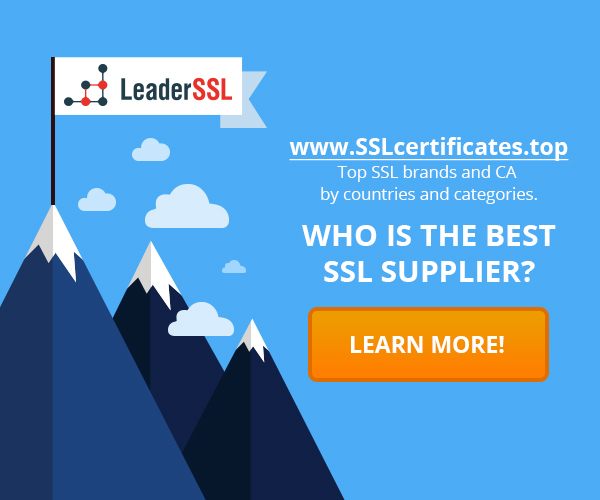 McAfee, TRUSTe and BBB – it is trust seals, while the rest – it’s SSL-seals, which actually suggests that the site is secure. It seems that the issue does not affect the technical safety, but rather a recognition of logos. I believe that Norton earned a high percentage of votes just because he simply is omnipresent – it has an antivirus program that is used on the computers of many people, which leads to the fact that it is perceived as a guarantor of the security of online payments. The same applies to McAffee. The results are broadly similar to the previous study carried out in 2011. 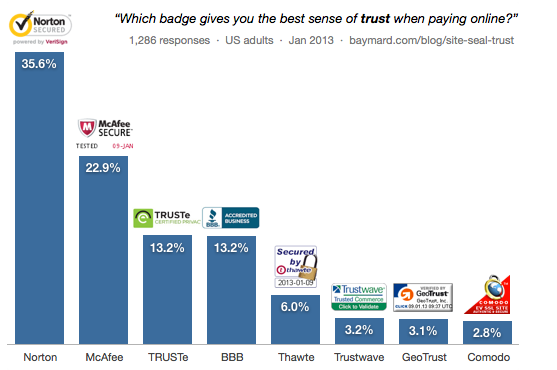 The most popular trust seals in e-commerce were then most famous brands such as Verisign and MCafee. At that time in the first place was PayPal, in 2nd place was Verisign, and then came the Mcafee, BBB and Truste. In that study were interviewed a total of 150 people, but these results can be taken into account. Why this test is not always adequate? Answers to this question were given very quickly. Man almost does not thought about the answer, because he just wanted to quickly finish the survey. It turns out that 49% of respondents simply do not care about the trust logo and the remaining 51% made their choice based on the brands they trust. Also it is necessary to understand that you need to know the opinion of those people who made purchases on the Internet by entering your credit card number. How do they react to seeing the icon next to the form entering the card number? What impressed them more? Does the presence of icon have the impact on their actions in terms of the purchase? The presence of different icons on the purchase page to see which icon is converted better. Icon with the text vs icon without text. If the icon placed too high on the page, the user simply did not pay her any attention. It is necessary to correctly choose the place to inform the person that his data is safe. What types of icons confidence exist? Security certificates are good, but only if users can recognize them. Trust logos must be specific call to action, but they must not take away the user from the site. Reviews of the site. It works because it shows that other people also bought online without any problems. Links with these logos leading to the page where are given different ratings for the seller, customer reviews, etc. Safe shopping is selling icons. They carry a minimum of protection. Schemes for safe shopping are different. For example, there is a shopping scheme from Google called Certified Shops, which shows customers the statistics of transactions, the percentage of successful purchases, etc. Do I need to place on the site trust logos? I personally doubt about this, as most clients don’t care about icons. In addition, there are other ways of getting trust for site, as, for example, the overall design of the site, its performance, quality checkout and the trust of customers to the seller. However, you cannot ignore such issues, even if they give a minimal effect, because sale depends on it. ‹ Installing SSL-certificate and IP-addresses: what you should know?